In the last few days, I have received several emails and comments asking for a “how to” on how I paint my furniture. Honestly, every piece is different but typically we do the same few steps. I will use my dresser redo to explain things since that is where the majority of the questions came from! You gals are so sweet with all of the compliments! For this piece, it was a dark wood with a glossy lacquer of some sort over top. I started by lightly sanding the dresser to remove some of that shiny junk off… I know, I sound so professional 😉 Then, I wiped off the dust from sanding. This roughened up the wood a bit and since I was using spray paint, I wanted it to stick really well. I also recommend using Gloss Off. 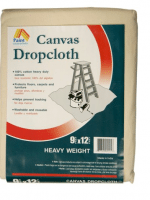 You can get it from Home Depot and it helps the paint adhere better. Next, I took all of the drawers and put them “face up” in the grass (I like to spray in the grass because once you mow the grass all your paint goes bye-bye and you have no overspray issues or clean-up! Sa-weeeet! I gave all of the drawers two coats of KILZ Spray Primer. 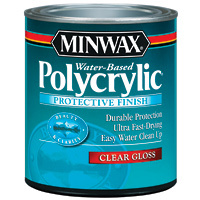 In my opinion, the BEST spray primer available and one can costs around $4 and it goes a long way. I believe I used 2 cans to prime all the drawers and the dresser. It really is the best stuff! The only issue I have found with this primer is that it can leave a little gritty texture once it dries so I used a shop rag and rubbed it off. It worked great! However, I have found that if you shake the can for 2-3 minutes (a really long time when you’re shaking the can!) You don’t, typically end up with the gritty texture when it dries. If you still get a gritty texture, run a piece of fine sandpaper over it to smooth it out. While the primer dried, I worked on the hardware. I laid the hardware on a plastic drop cloth and sprayed it with 2 coats of Oil Rubbed Bronze spray paint. 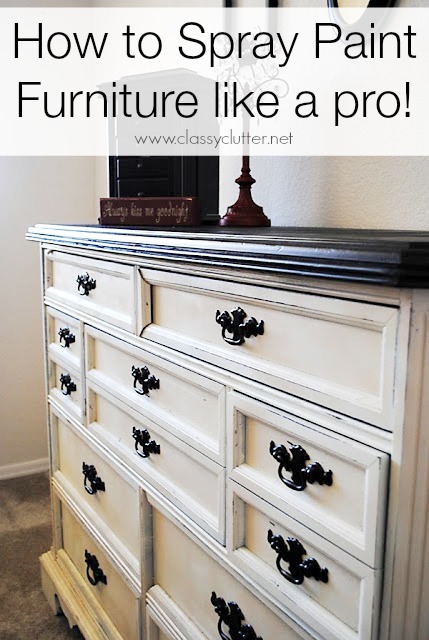 Check out my post on How to paint furniture hardware (the right way!). Then, while the hardware dried, I went back to the grass to paint! PS. I live in Arizona and I painted at 1:00pm in the middle of July in 114 degree heat. I am NOT exaggerating! That’s how much I wanted to finish this and that’s when my little boys take their naps so I didn’t have much of a choice! That being said, the paint dried VERY quickly! Next came the paint! 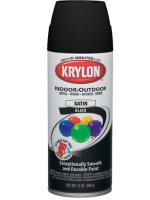 I always use Krylon or Rustoleum double cover spray paint. Krylon has an amazing nozzle for spraying weird angles but Rustoleum has awesome coverage. Both are great! I used Krylon Ivory for the base and Krylon Black for the top. I learned a great painting technique by watching this video. I really think it is the best way. 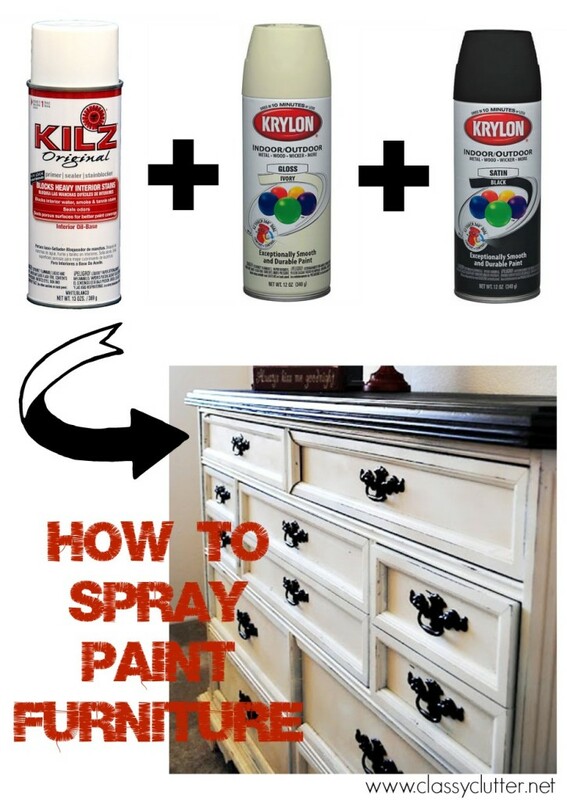 This is the technique I used for painting this dresser and I do the same on every spray paint project. For the top of the dresser, I taped up a piece of cardboard to the base of the top, to protect the ivory and painted the top black. I wish I had a picture of how I did this to show you because it really worked well. Sorry loves! After the paint dried, I used a sanding block to distress the edges. Finally, I used a smooth paint roller like the one below to roll a coat or two of Polycrylic over the top to protect the black surface. Finally, reattach your hardware and jump for joy that you are done! Your furniture will thank you for bringing it back to life! 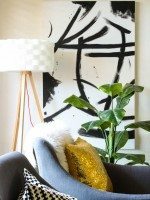 If you’re new to painting, I would HIGHLY recommend visiting All Things Thrifty and read her post Painting Furniture 101. This is where I started several years ago and I am sooo thankful for this post to set me in the right direction. Check out her piano transformation here! it is TO DIE FOR! Hope this helps!! If you have any questions on what to do, leave a comment or shoot us an email! THANK YOU THANK YOU THANK YOU!!!!! That doesn’t seem as overwhelming as I thought it would be!! I live in AZ too and might do it tomorrow LOL! Oh love the sunny days! Thanks for taking the time to do this!!! 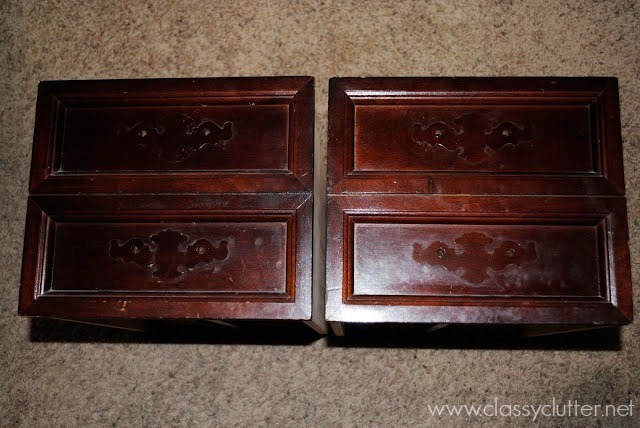 Do you have any suggestions for painting lacquer furniture? I love these tips – I need them! Thanks! well now I gotta try this. I’m seriously impaired when it comes to painting furniture. Seriously! But spray paint? Now we’re talkin’! Dropping by from TDC’s Before & After. Im obsessed with spray paint right now.. I have not attempted furniture yet though. Maybe I will soon 🙂 Thanks for the tips! 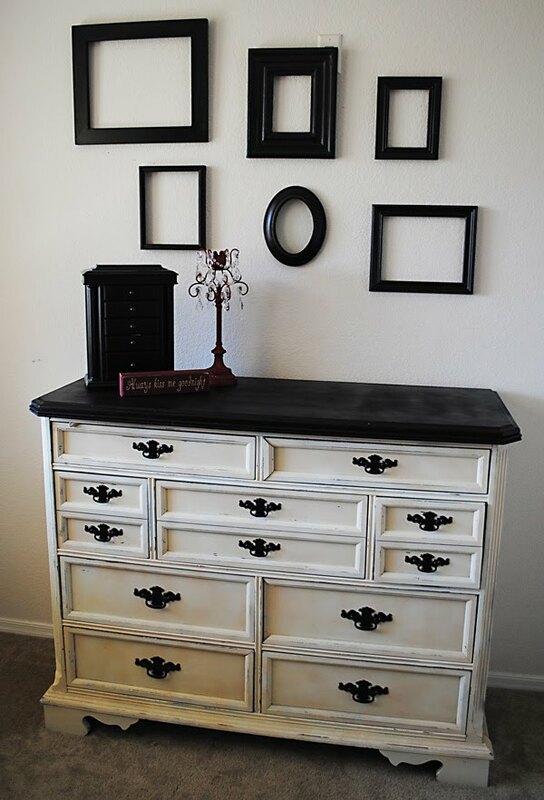 When I showed my 24 year old daughter this picture as her dresser is as old as she is and it needs a new life, she loved the idea of how you did it. Thanks! Very helpful post! I haven’t tried the spray primer on a large piece of furniture but would like to. Thanks for the tips! What an awesome idea! It looks great! Thanks for sharing! I also live in AZ and CANNOT WAIT to use this. I have a few things in my house that need some TLC. So excited that it’s nowhere as near as hard as i thought. I read and pinned this post early in the week and it just so happens that I picked up a SWEET dresser at a garage sale for $20 this afternoon, thank you for your post I cannot wait to refinish it!!! This is beautiful! I’m always looking for good tips. I’m about to refinish a vintage highchair and can’t wait to see how it turns out…if I do it right!? Awesome tutorial! I didn’t even think about spray paint primer! Thanks for the tips! I pinned for later. 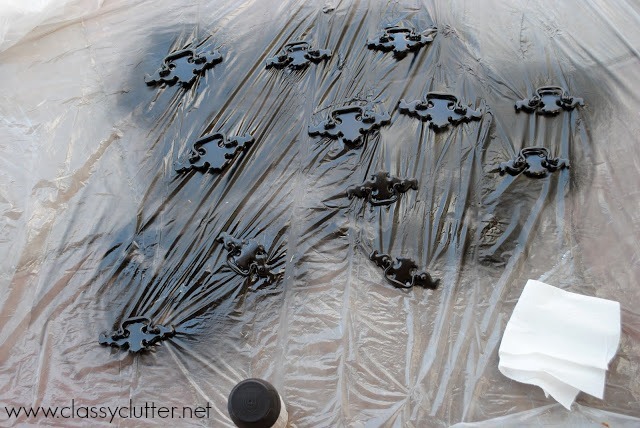 I have gone through this process and after applying polyurethane, it still feels tacky. Any suggestions? Thank you for this! I am in the process of painting an old bed for my daughter. This post couldn’t have come at a better time! The dresser looks amazing. Pretty finish. I always feel inadequate when I read about someone’s success with such simple techniques. I find spray paint very difficult to work with. It drips. It’s hard to get even coverage. And rolling poly? That was a disaster on my recently painted kitchen chairs. Foam everywhere. I had to sand it back to the primer and start over. All I can say is good on ya, girl. You rocked it. That dresser is lovely and you have inspired me! It (painting) doesn’t look as intimidating as I thought. Great info and so easy to follow! Thank you! This is gorgeous! And great tips. Thanks for sharing! I found you through Thrifty Decor Chicks link party, and am a new follower! Can’t wait to see what else you do! 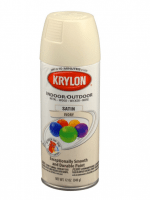 Is the Oil Rubbed Bronze paint for the hardware also by Krylon? Can I spray this directly on the hardware without any prep? Did you put any kind of sealer on the bottom part of the dresser? or just the poly on the top? What is your secret to using a sponge roller? I get a webbing look. Does that blend out when dry? Appreciate your help! Is the Kilz primer water based or oil based. 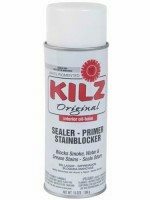 I cannot find the kilz primer where I live and was wondering what its specifications are so I can find a similar product. Your help would be greatly appreciated. The only word I wanted to tell you what you do, I suppose I can say is just perfect. This should be a piece of mobilya to create from scratch. I tried to watch the video, but it said that it’s private. Any other suggestions on where to look? Thank you for sharing, great information! Have you e er tried Miss Mustard SeedMilk Paint? You add a bonding agent to the first coat of paint, no priming or sanding in 2 coats you are done. I recently bought a night stand at goodwill that I painted.. I really wish I read this first cuz I didn’t know the first thing to do.. Should what would u recommend? I sand it but I east real wood? So I cleaned it then used a krylon primer and krylon black gloss to paint. I had no idea how I should seal it! Thanks for share. Çocuk Odaları is here. Very nice! I have two ‘shiny’ stained bookcases I want to paint. Good instructions. Thanks for share. Nurs Panax is here. 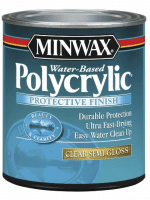 polycrylic is a horrible product. it takes months to fully cure and it is very difficult to get it smooth because it’s not like polyurethane where you can sand it. learned this the hard way. I’m visiting you today from Sunday Scoop. I hope you get a chance to stop by my blog and leave a comment and Link Up, too! This can be a improper comprehension from type, it are going to do problems in the type on their own. Thanks.. I tried this today, but I must have done something wrong. The primer and paint are just brushing off like powder. Any suggestions? Hi, I have a question. Can you spray paint furniture if it is MDF? My bedroom furniture is just a put together set from Walmart or target and is old, but I don’t want to go buy a new one yet. And I want to paint it. but it’s not pine or oak or any other good wood. Will spray paint work on it? I have been thinking for a long time that I would maybe like to paint my bedroom set an antique white and distress it. Now I KNOW I’m going to! 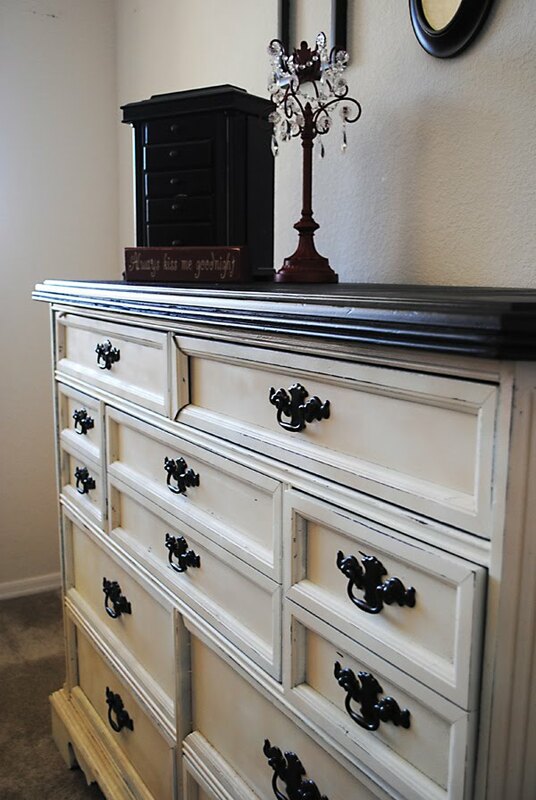 This dresser is EXACTLY like mine and I LOVE how it came out. Great job!! Was just wondering how did you do the distressed look on this dresser? Excellent tips! I’ve been wanting to do this for my daughters dresser, so this is very motivating. I tried watching the video you recommended, but it says private. Is there any other way to view it? I noticed the primer is oil based. Does that matter? Thanks for the helpful blog. Question about the Policrylic finsh. The image you have posted shows it is water based, but I believe the Rustoleum double coverage spray paint you recommended is oil based. Before I finish my project, will I run into any problems because of this? Hi, Loved reading this over on how to do a dresser. I wanted to watch the tutorial on the spray painting, but it said it was private. Is there a link that I can look at the video on? I had to laugh when I saw your lawn, I thought…oh she must live in AZ. Then I noted The Scotts said they live in AZ, too. I am in Cali with three of my kids/family in AZ. Two in Mesa and one in Show Low. Was the spray paint a flat finish or semi gloss? I just bought chairs on wheels for the kitchen that have a gold bar that needs spraying. They are the bucket kind. What is the best way to go about it? I already stripped 2 chairs down to the shiny gold metal. Are these products safe for cats? I am painting my desk, and my cats like to sit on it, so I want to make sure I make it safe for them. Any tips? What grit sand paper did you use to distress the base of the dresser? Also, did you apply a top coat/sealant on the base. It’s really very informative that I wanted ever, thanks for providing information about furniture paint. Glad we could provide you that information! Thank you stopping by! Oh, these are wonderful ideas.! What is your secret to using a sponge roller? The how-to paint video is private…how can I gain access? Thanks for a great post! I just bought a paint sprayer machine. Your post really help. Thank for share this guide ! Wow!! This is an easy way to paint furniture.I also want to paint dining table and chair of my house by spray.Thank you for sharing this post. Hi! Your link to the video you used for your painting technique says the video isn’t available…can you refer me somewhere else to learn the technique? You just made my furniture project less daunting of a “job!” Thank you. My only question is what grit sandpaper did you use to distress?? Can you really use a roller to poly with? This helped alot. 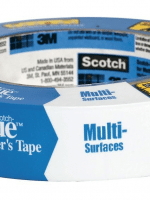 Can I use a laquer? definitely subscribing. Also how about a spray paint with primer in it to save time, since im planning on changing the colour of my stool depending on the season.